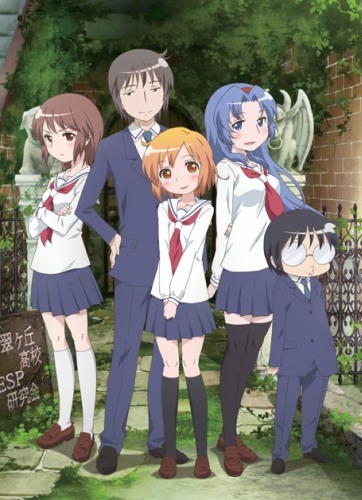 Plot Summary: Ever since Kotoura Haruka was a little girl, she was able to read the minds of those surrounding her. And even though this gift may be special, in her life so far it only had devastating results: Her innocent babbling led to the divorce of her parents, who then left her with her grandfather. And in school Haruka loses all her friends, since none of them would or could admit the truths Haruka was able to so easily read in their minds. Haruka transfers to a new school, but has no hope of finding friends, and thus decides to keep quiet about her ability. That is, until she meets Manabe Yoshihisa, an imaginative slightly perverted boy, who becomes her first true friend, vowing to always stand by her side. Soon the enthusiastic Mifune Yuriko, president of the Paranormal Society (ESP) club, learns of Haruka's ability and vehemently invites her — literally dragging her off — to join the club. There the club's only other member, the under-tall, level-headed vice president Muroto Daichi welcomes her. Both Yuriko and Daichi readily accept Haruka... and for the first time she is happy, surrounded by friends, who do not treat her like a freak.